Pull down, single pole spray faucet, finished in Satin Nickel. Faucet features solid brass construction, easy to change out ceramic disc cartridge, backflow prevention, and dual spray/stream flow. Spray head extends to 24. Certified by cUPC<sup></sup>. Lifetime mechanical warranty, and 2 year warranty on decorative finish. Combo Set 3-Handle Claw Foot Tub Faucet with Hand Shower in Satin Nickel Enjoy the nostalgic feel of a classic claw foot faucet. With an old fashion telephone style hand shower. Porcelain inlaid hand shower and temperature handles. Combo includes faucet, supply lines, shutoff valves and drain. 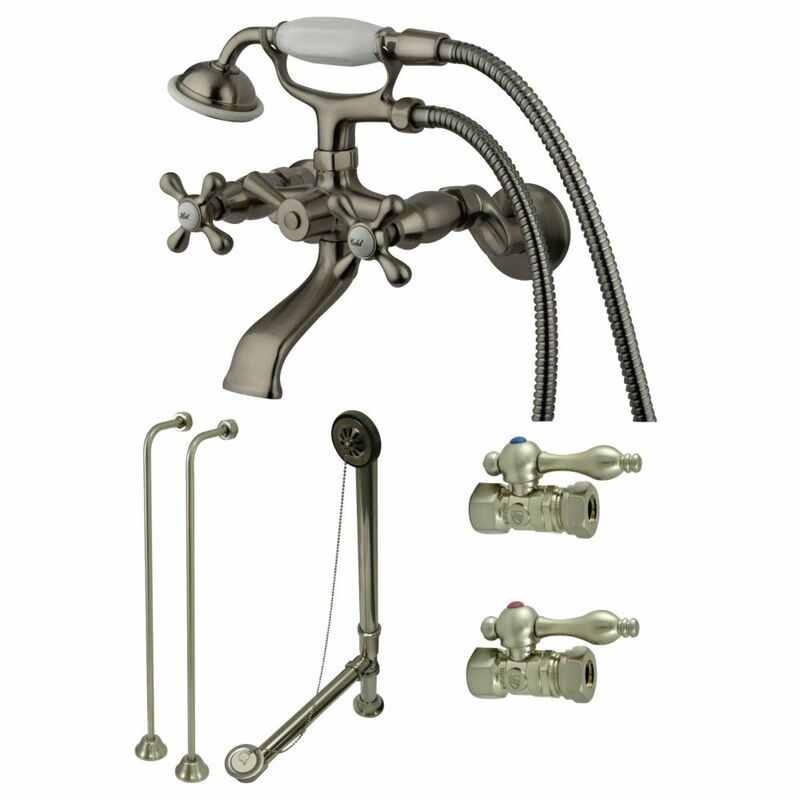 Combo Set 3-Handle Claw Foot Tub Faucet with Hand Shower in Satin Nickel is rated 4.5 out of 5 by 2. Rated 4 out of 5 by RickR from The kit has everything needed to install. I would... The kit has everything needed to install. I would give it a 5 star, however one of the handles has a manufacturing flaw. When it is turned on/off the handle is crooked. This is not an issue with performance. Most people probably would not see it. Rated 5 out of 5 by Shaina from Definitely the best value!! It come with everything you need... Definitely the best value!! It come with everything you need rather than purchasing every component separately. The pipes come longer than you need, so you can cut them to size. Very durable and BEAUTIFUL!! The faucet can be installed at 4-inch center set. But the drain is 1-1/2 inch. Click on &quot;Manual&quot; to see measurement chart. Is this compatible to the Kingston Brass claw foot tub Model#HVCTND6030NT5 SKU #1000855972? No, that tub uses a faucet that does not attach to the tub. This faucet needs to mount to the tub.